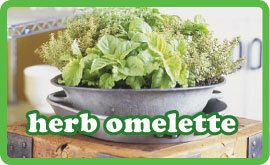 If you’re looking for a quick burst of taste without much hassle, then try this Iranian recipe for herb omelette. It’s a great light meal and is truely delicious. It’s just as good hot as it is cold so great for a picnic or just something on hand for a late night food panic. 2. Combine all the greens together in a large bowl, sprinkle over the flour and a healthy grinding of salt and pepper and toss well. 3. Beat the eggs well and then pour over the greens stirring thoroughly. 4. Pour oil into an oven proof frying pan or a cake tin and coat all the surface. 5. Pour in the egg and bake in the centre of the oven for 45-50 minutes until browned on top. Can be served hot or cold. The recipe called for yoghurt on the side, but I ate with Lebanese Garlic Sauce and salad and it was a triumph!